[O]AQ: What Exactly Do You Folks DO Over There? [Occasionally] Asked Questions is Peak’s resource for all of those random climbing questions you always wanted to know the answer to. Got something you’re wondering? Email Erin and she’ll find out the answer! Q: What exactly do you folks DO over there? If this kid can do it, so can you! A. The short answer is: we rock climb! Peak Experiences is an indoor rock climbing center in Midlothian, just south of Richmond, Virginia. We’ve been encouraging folks up our walls since 1998, and are partners with Passages Adventure Camp, which runs every summer down on Belle Isle in the James River. If you want to come climb with us, there are a few things you should know. The first question you should ask yourself is “am I 18 or older?” If you aren’t, you need your parent or guardian to fill out our Acknowledgement of Risk form. This document must be signed and handed in in hard copy. Under Virginia law, the signature must be from a parent or legal guardian; even if you’ve got permission to bring your niece in for the day, you can’t sign for them. (Lawyers make life difficult for everyone, don’t they?) If you’re 18 or over you can fill it out and sign it here. Once the icky paperwork is out of the way, the second question you should ask is “do I have any climbing experience?” Be honest – climbing one time at a carnival isn’t really climbing experience; even if you’ve been climbing for forty years, you still have to play by our rules. So which is it? I’ve never really climbed before. Awesome! Happy to have you. Get ready to get addicted to something awesome. If you’re brand new to the sport, you’re going to need a belayer – that’s the person holding your rope so you don’t fall, even if you let go of the wall. Belaying is a life-saving skill, so you can’t just “try to figure it out” – we offer classes on belaying eight times a week and you can make a reservation to take our certification test any time we’re open. If you’re not ready to learn to belay yet, or just want to get out there and climb, that’s great! You’ll still need a staff person to belay for you, which means you’ll need to either make a reservation or come during our Open Climb hours (Saturdays and Sundays from 11am to 4pm). Check out our website for information on our specific introductory packages. Awesome! Happy to have you. If you’ve never climbed here before, we’d love you to take our belay certification test. It’s a simple show-us-what-you-know test to keep our insurance company happy. Once you pass that, you’re good to go. If you want to lead climb, it’s another quick test – but you get to take a whipper, so that’s fun. If you haven’t used an ATC or don’t know the figure-8 follow through knot, that’s fine. 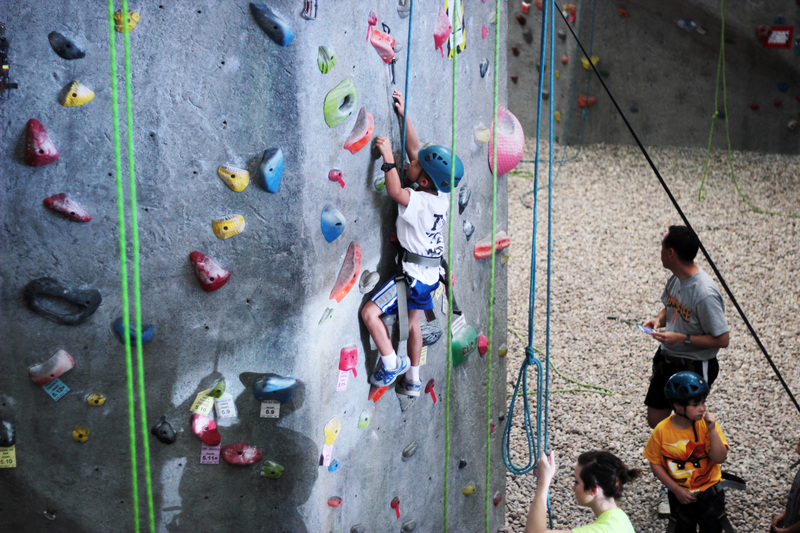 You can’t belay today but you can use our auto-belays or our awesome bouldering cave. If you want to take our belay class, that’s cool too! Our class is designed to teach you everything you need to know to pass our test. If our standards seem stringent, it’s because we care – climbing is a dangerous sport, and the more you know, the less risk you put on yourself and your climbing partners. Climbing is awesome! Now what? Once we’ve got you hooked, there are tons of options for making the most out of your newfound excitement for the sport. Ask any one of our friendly staff members for more information about our member perks, youth programs, and advanced classes. This entry was posted in Indoor Climbing, OAQ and tagged Indoor climbing, OAQ. Bookmark the permalink.